As natural resource professionals, it is important to reach new landowners. However, low response rates to direct mailings or other outreach efforts can be frustrating. Social marketing is one tool that can help elicit a greater response. In a recently published paper, the Driftless Forest Network (DFN) reflected on what they learned from their outreach efforts in southwest Wisconsin. We have summarized some of the key findings but for more details the full article can be found here. 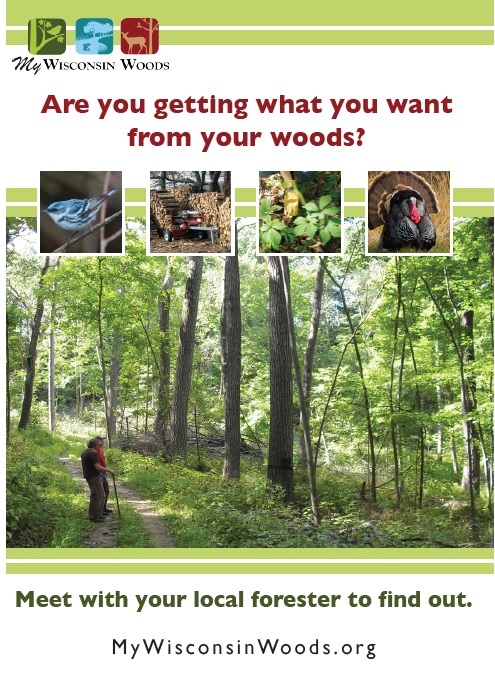 The DFN randomly sent a sample of woodland owners one of two offers free of charge: the chance to get an informational handbook or a visit from a forester. Roughly 18% of landowners who were offered the handbook accepted the offer and were mailed the handbook. A much lower percent, just above 5% in two campaigns and below 3% on the third campaign, agreed to have a forester visit their woodland. Despite how helpful and impactful a visit from a trained forester can be, landowners were more willing to accept the informational handbook offer, likely because it required less time, commitment, or forestry interest on their end. The DFN tested the impact of several different messages, but the different approaches did not produce noticeable effects across the random sample of woodland owners. However, they found that certain messages worked better within an appropriate landowner segment. For instance, people with a high score on a hunting interest index were 1.9 times more likely to accept forester visits when sent a message specifically geared towards hunters than those with a lower hunting interest score. Similarly, among large landowners (greater than 97 acres), financial messages generated more responses to a campaign than wildlife-specific or more general messages. In some cases, a general message sent to a broad audience may be the best you can do. However, by reaching out to a more targeted landowner segment and tailoring the message to them, your chance of success can be improved. Whenever you are preparing a publication or program, take a minute to think about the material from the perspective of your audience. Determine why they are interested or hesitant to take action and make sure your materials resonate with them. Rickenbach, M., Greenberg, J., Huffaker, B., Knoot, T., Koshollek, A., Nielsen, C., Núñez, J., Simoni, J., Swenson, S. 2017. Using social marketing to engage Extension audiences: Lessons from an effort targeting woodland owners. Journal of Extension, 55(3): 1-13. Generate new leads and a greater response from forest landowners using social marketing tips from the DFN and their work in SW WI.